Quick overview A must-read leadership fable of how a school leader inspired real transformational change by leading in accordance with his own values and beliefs. Will Ryan's Dare to be Different: A leadership fable about transformational change in schools tells the fictional tale of Brian Smith - a primary school head teacher who listens to what his political masters have to say, but then sets out to inspire real transformational change by doing the exact opposite and leading through his own values and beliefs. Writer and novelist Michael Korda claims that `the fastest way to succeed is to look like you are playing to someone else's rules whilst quietly playing by your own'. 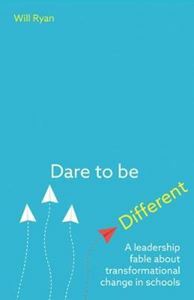 Dare to be Different illustrates how real transformational change can occur when a school leader does just that, as Will Ryan shares the trials and tribulations of the story's fearless protagonist, Brian Smith, as he endeavours to take back ownership of what happens in the classroom. Exploring the significant challenges that school leaders often have to overcome in order to turn their dream into a reality, Dare to be Different lays before the reader a model of inspirational school leadership in this engaging and humorous take on life in modern schools. The story is told through the eyes and experiences of Brian as he resists top-down government directives on how his school should be run and instead strives to build a vibrant curriculum with which to hook the imaginations of today's children. Scattered among the narrative's twists and turns are deeper insights into the nature and purpose of schooling that are sure to rekindle school leaders' passion for pupil-centred education over policy-led prescription, and which will motivate them to `dare to be different' in standing up for the education they believe in. *	At least one-hundred-and-eighteen tips that are based around exciting primary practice and which should make the hairs tingle on the neck of the most wizened school inspector. *	At least forty-five significant ideas that will strengthen leadership and have the capacity to transform your school as a learning community. *	At least fifty quotations that will make you think about how our most inspirational leaders create inspirational teachers who get an inspirational response from their learners. *	Compelling pieces of evidence to demonstrate that primary school teachers are doing a fabulous job, despite what any politician or tabloid reporter would tell you. Suitable reading for all school leaders - at both primary and secondary levels - who are looking to promote excellence and raise aspirations within their schools and wider communities.